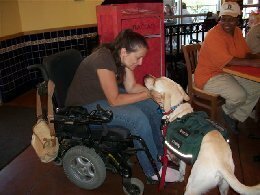 Our first Service Dog Project, in 2010, was Rocco, a yellow lab mix. Rocco was a stray found running on the streets. We had put him up for adoption and for over a year no one wanted him. That was when one of our volunteers saw him and realized he would be the perfect candidate for service work. He had energy, was fairly young, and was driven. Rocco could get a home and have a job and someone in the community could have their life changed. 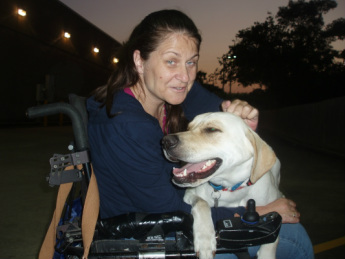 Our volunteer knew Sherry Govella, paraplegic woman in Pearland, Texas who could benefit from a service dog and after having Sherry and Rocco meet we knew it was a match made in Heaven. The training began. It succeeded thanks to the support of N.A.B.S.’ friends like local veterinarians who donated their services, Bob Bolander at Man’s Best Friend in Houston who provided protection training and supplies, and our home town paper whose front page featured Sherry. In addition thanks goes to various businesses and individuals who donated toward the cause. Rocco was transformed from a scraggly, unruly stray dog into an obedient, protective, service dog for a paraplegic woman who, in herself, is an amazing story! Thanks to Rocco, Sherry has a buddy who is always with her, willing to pick up anything she drops. She no longer has to fear going places alone and now has a sense of freedom. Now if someone grabbed her purse or tried to hurt her she will no longer be vulnerable! N.A.B.S. volunteers and our community came together and now the dog someone abandoned as worthless is valued at $35,000. Rocco was thrown a graduation party by his supporters to publicly acknowledge those who helped support him on his journey to becoming a service dog. Check out the front page Alvin Sun newspaper article on him. Mayor Reid of Pearland officiated as Rocco made history in Brazoria County. This was the first time in Brazoria County History a non-profit organization based in Brazoria County rescued, rehabilitated, and trained a dog to become a service dog, and then donated it to one of our own disabled citizens. 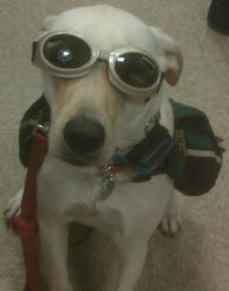 Rocco was the first N.A.B.S.' 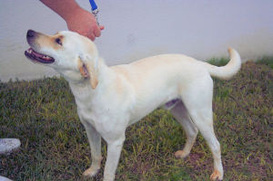 rescue to become a service dog and Sherry was the first recipient of a service dog from N.A.B.S. He was once an abandoned animal then he was rescued and trained to be a service dog, finally he was donated back into our community for one of our own disabled residents at no cost to her! Check out Sergeant Major, N.A.B.S.' second service dog. 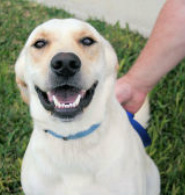 Please designate 'service dog' when you donate if you want your donation to benefit this area.